Lay some newspaper across the student's desks for protection and easy clean up. Use two toothpicks to put the Styrofoam balls together. Place the first toothpick halfway through the middle of the large Styrofoam ball. Slide the medium Styrofoam ball onto the end of the first toothpick. Stick another toothpick halfway in the top of the medium-sized Styrofoam ball and slide the small Styrofoam ball over it. This is the snowman frame. Use black pom-poms for the eyes, the mouth, and the three buttons down the front of the medium ball. 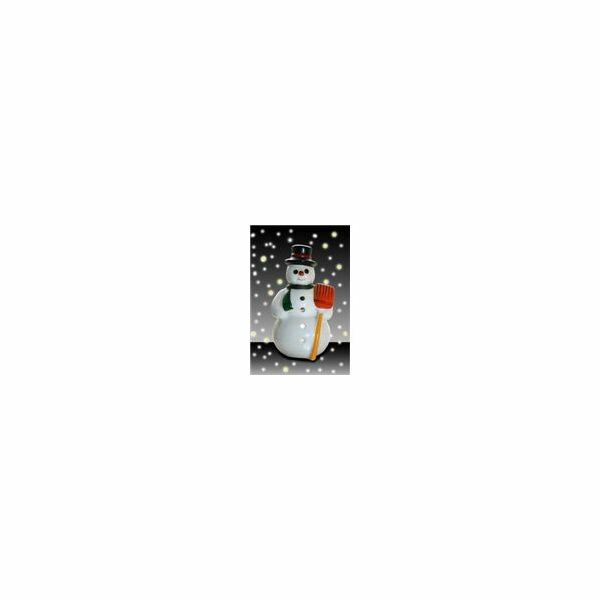 Between the eyes, glue an orange pom-pom as the nose of the snowman. Cut out a scarf from some fabric. The fabric can be any design or color. Just cut out a long thin rectangle. Cut the edges to appear frayed. This is the scarf. Drape it over the snowman's neck and tie it in place. Stick one toothpick in each side of the medium-sized Styrofoam ball. These are the snowman's arms. Make a top hat out of black felt. You will need three pieces to assemble the top hat. Use the picture below as a guide. Cut a big circle for the bottom of the top hat and a small circle for the top of the hat. Draw and cut out a rectangle. Use the rectangle to form a cylinder shape. Glue the rectangle (cylinder) to the big circle. There will be a hole at the top. Glue the small circle to the cylinder to finish the hat. Wait for the glue to dry and enjoy your new Styrofoam snowman. Shave the bottom of the snowman so that it is flat and can stand up on its own.